Researchers indicate that sandalwood could be an effective chemopreventive agent against skin cancer. 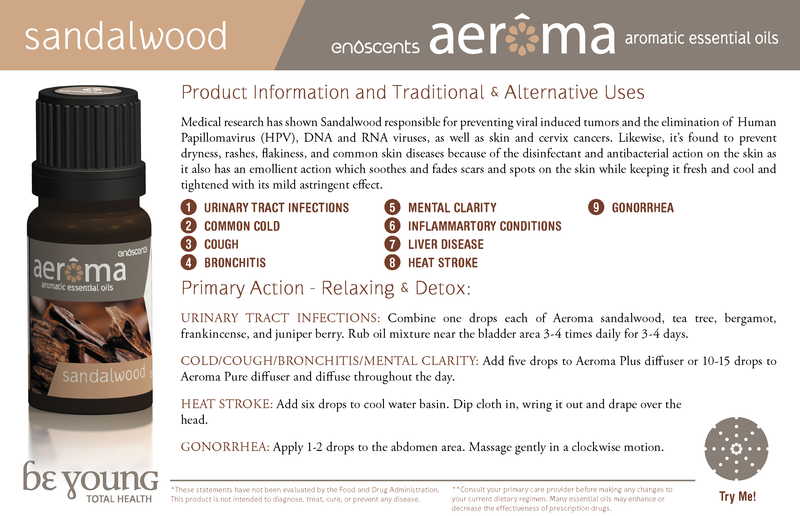 Sandalwood shares the same lengthy history as several of our other essential oils just as Frankincense and Myrrh. It was harvested in ancient days for the benefit of the skin of the royal court. After much use in this manner its pleasant side effects were discovered which included a sense of “centering” and strength felt by the users. It became a mandatory use for wives during the dark ages by their husbands because of its benefits to calming and clarifying the body and the mind. Anticancer agents: Based on an in vitro study, the sandalwood constituent alpha-santalol may induce apoptosis (12). Antifungals: Based on an in vitro study, sandalwood may have antifungal properties (6). Anxiolytics: Based on preliminary human study, application of the sandalwood oil constituent alpha-santalol on patients' skin caused significant physiological changes (blood oxygen saturation, blood pressure, breathing rate, eye-blink rate, pulse rate, skin conductance, skin temperature, and surface electromyogram), which were interpreted in terms of a relaxing/sedative effect, whereas sandalwood oil provoked physiological deactivation but behavioral activation (13). Combined use of anxiolytics with sandalwood may result in additive effects.